Rahab (Hebrew: רחב, Rēḵāḇ; "Name means::broad, Name means::wide") (b. ca. Born::2533 AM) was a prostitute, probably attached to the temple of Asherah in Jericho, and one of the most important converts in the history of Israel (Joshua 2 , Joshua 6:17,22-23,25 , Hebrews 11:31 ). The number of theories as to the actual career of Rahab is almost as great as the number of commentators on her story. The Hebrew word that describes Rahab is זֹּונָ֜ה or Zanah, which can mean a woman who commits adultery, or an ordinary prostitute, or a cult prostitute—a woman who offers sexual pleasure to a man as a means by which to bring that man closer to the object of cult worship. 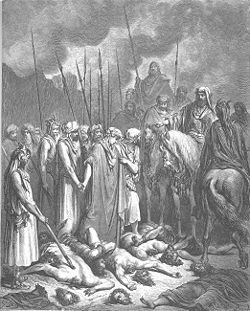 Cult prostitution was a known part of the cults of Baal and Asherah, because both these deities were associated with fertility. But many commentators, including Matthew Henry and C. H. Spurgeon, speculate that Rahab's practice was ordinary commercial prostitution, which she practiced for monetary gain only. A minority of rabbinic commentators suggest that the actual word used to describe Rahab was the word for "innkeeper." However, Henry and Aust suggest that Rahab played both roles. Whatever her actual role, she showed that she was very well-informed and therefore a valuable source of information to two Israelite spies who had come to the city. She knew the history of the children of Israel, including the Exodus of Israel from Egypt, the miraculous crossing of the Red Sea, and the utter destruction of the Amorite kings in battles that had been fought less than a year before. And she definitely knew that the people of Jericho, from its king to its most lowly resident, were terrified. How two spies betrayed their presence, the Bible does not say. The king of Jericho received word of their presence and somehow thought that Rahab might be able to detect and report them. Rahab's house was actually part of the city wall and was probably in a location advantageous for business. In any case, the king sent messengers to Rahab asking her to surrender her guests. Rahab told the king's messengers that, although she had received two lodgers, she did not now where they had come from, and that they had already left the city shortly before the nightly closing of the gate. She even suggested that the royal police ought to follow after them and might be able to overtake them. This statement was a lie, and is one of many instances in which Biblical persons of good will have lied in order to protect themselves while doing good. At issue is whether telling a lie is ever an acceptable, much less a commendable, practice among Jews or Christians. While some commentators think that her willful misdirection of the king's messengers was commendable, others do not, and suggest that Rahab's motive for her lie was self-protection and a failure to recognize that a God Who could capture a fortified city could also spare a single life. Thompson and Estabrook remind their readers that Rahab received political asylum and blessing for concealing the spies but not for lying to the royal police about her act. To tie a red cord in the window so that the army of Israel would recognize it. She agreed to these conditions, and then allowed the spies to climb out of her window and down the wall. About eleven days later, the armies of Israel began seven days of marching around Jericho. On the last day (25 Abib 2553 AM, or April 30, 1451 BC), the Israelites blew their trumpets, and the walls of the city fell. Rahab's house was the only dwelling that was part of the wall that remained standing. The two spies whom Rahab had met eighteen days earlier now returned to her house to summon Rahab and all her family to Joshua, the commander of the Israelites. Joshua granted her a full pardon and allowed her and the members of her family to keep their property. Everyone else in Jericho was summarily executed. The gold and silver, and implements of brass and iron, were melted down and became part of the Tabernacle treasury, and every other personal possession, and every beast, were destroyed. Rahab joined the nation of Israel and remained loyal to it for the rest of her life. She married Salmon, who may indeed have been one of the two spies, and bore a son named Boaz. (Matthew 1:5 ) Most Jewish commentators state that she married Joshua, but the Bible says otherwise. ↑ 1.0 1.1 Aust J, "Rahab: from Harlot to Heroine," Good News, March-April 2002. Accessed January 19, 2009. ↑ "The Domain of Baal: Resurrecting Interest in the Ancient Deity," 1995. Accessed January 19, 2009. Note: The views expressed on the above-referenced site are those of its editors and publishers and do not represent those of CreationWiki. ↑ 3.0 3.1 Henry, Matthew, "Complete Commentary on Joshua 2," hosted by E-Word Today. Accessed January 19, 2009. ↑ Spurgeon CH, "Rahab's Faith," Sermon 119, March 1, 1857. Accessed January 19, 2009. ↑ "Rahab," Women of the Bible, n.d. Accessed January 19, 2009. ↑ Blank W., "Rahab," Daily Bible Study, n.d. Accessed January 19, 2009. 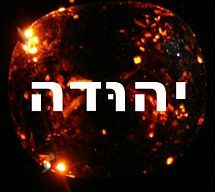 ↑ 7.0 7.1 Hirsch EG, Seligsohn M, et al., "Rahab," The Jewish Encyclopedia, 1906. Accessed January 19, 2009. ↑ 8.0 8.1 Hanko H, "Rahab's Lies," The Mountain Retreat, n.d. Accessed January 19, 2009. ↑ 9.0 9.1 Thompson B and Estabrook S, "Does the Story of Rahab Mean that God Condones Lying?" Apologetics Press, 2004. Accessed January 19, 2009. ↑ See, for example, Chadwick P, "Rahab: the Scarlet Woman of Christmas," History's Women, n.d. Accessed January 19, 2009. ↑ One Israelite, Achan, tried to steal some gold and silver and an article of expensive clothing; he was executed for this. This page was last modified on 21 April 2015, at 16:21.